What was on sale in 1960…. 1960 is our year of choice for this article, it was the year that The Beatles was officially named and formed, the Mark 1 Mini had only just recently been introduced and in space exploration the first probe was launched to go to Mars although it failed to reach it’s target. Back down on earth and with our new Mini on the driveway trying to out-shine next doors Morris Oxford, there was also a whole host of equipment available for the garden. The image on the right shows some of the items that no self-respecting suburban homeowner should be without to keep their garden as tidy as possible. Clockwise from top left is the Fisons Evergreen fertilizer spreader able to treat 64 sq yards of lawn on each fill-up. The price was 59s 6d for the spreader and the fertilizer itself was from 3s 11d. The Greensleaves garden shears on top of the box were 34s 6d and were available from Derry & Toms the London department store in Kensington. For a more upmarket experience why not shop at Harrods? They were retailing the illustrated lawn roller which could be filled with either water or sand, available in several sizes with a range of prices starting at £3 7s 11d up to nearly £7. One’s chauffeur could fetch it home for ones gardener….. The Army & Navy Stores were selling the small Webb Lawn Trimmer push mower for the smaller areas of lawn for £7 19s 7d, whilst the push lawn aerator was £4 15s and another Harrods purchase. The Tarpen Little Giant chainsaw in the very bottom right corner of the first picture could be used with a single hand and cut through 4″ branches, the price to you in 1960 was £22. There were many machines on sale in 1960 which were engine powered. 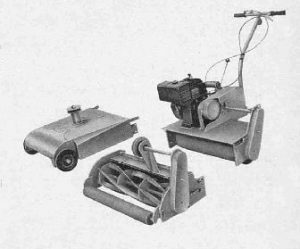 One such was the self-propelled Shay Rotogardner 125, pictured right, powered by a “four-stroke Aspera engine and impulse starter making it easy to operate” according to sales literature. It had specially tempered steel tines that “will break up any soil“. The cost of the complete machine as pictured was £67. Or how about something to cut the lawn such as the Ransomes Sprite pictured below. 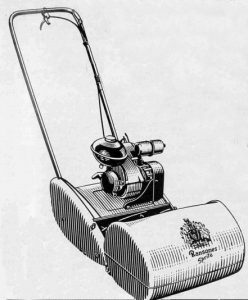 In April 1960 Ransomes were advertising this as a new mower with 14″ cut and as being ‘the lowest priced motor mower in it’s class‘ costing £32.17s.3d. For something more expensive on sale at the same time and also from Ransomes was their Marquis mower with 18″ or 20″ cut powered by a Clinton 4-stroke 117cc engine, prices started at £74.1s.9d, and £89.0s.6d for the 20″, an electric version was also available. Ransomes 14″ cut Sprite for £32.17s.3d. Through the decades battery-powered machines have been a bit of a novelty, if one didn’t want a petrol mower or be tethered by an electric cable to a three-pin plug then in late 1960 Webb had the answer with their ‘new to the market‘ rechargeable battery mower model, no mess, no fumes or noise. Webb previously showcased a remote controlled battery mower to the general public in 1959 at the Chelsea Flower Show but this one is just the ordinary walk-behind type – there’s a great vintage image on our Webb gallery of a sale of a battery mower taking place. The battery mower cost £58.19s.5d for the 14″ cut and £48.19s.10d for the 12″ cut. They were available from ‘all large stores and hardware shops‘ so Webb were reaching out to a large customer base and could see some potential. 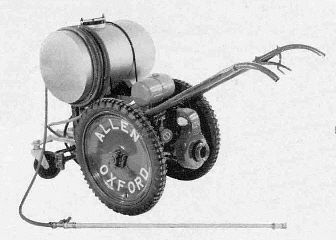 Still in 1960, Godfrey’s of Marylebone Lane, London, were advertising the “Allen Universal Self-propelled Motor Scythe” with a two or four stroke Villiers engine – pictured below. The image shows it with an attached spray tank and four foot lance, apparently all the attachments just plugged in. The machine itself was £98.15s; the spray tank was £23.10s; spray pump including lance was an additional £39.4s.6d. Hayter Scythe with a Villiers 4-stroke engine. 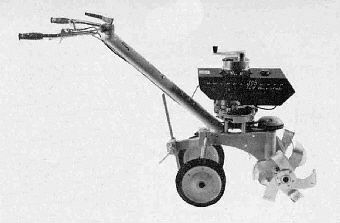 Several manufacturers designed machines that were able to take attachments just like the Allen scythe could with the sprayer. 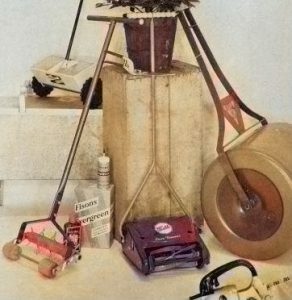 Hayter made the Hayter Scythe – pictured right is a model which consisted of a power unit that could be used as a rotary scythe or cylinder mower. 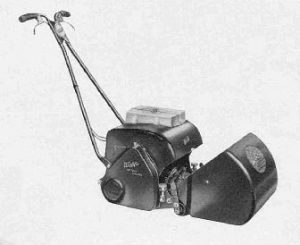 Powered by a Villiers 4-stroke, 265cc engine and with a three-speed gearbox and kick start the machine had adjustable cutting height for the scythe attachment and could be converted to a 30″ cylinder mower complete with roller, a good machine for a larger garden where the most use could be gained from it. Again available from Godfreys, or A.T.Oliver & Sons, Luton or our favourite (who most have sold every machine ever created) Robert. H. Andrews Ltd, Sunningdale. Price: £119.10s; cylinder mower an extra £47.16s; and the grass box another £7. 15s. 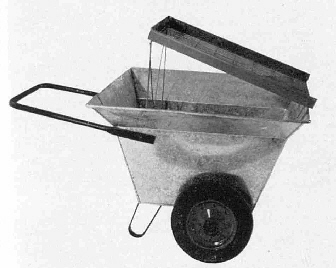 For helping around the garden in the early 60’s, the Army & Navy Stores were selling a light but strong metal wheelbarrow with pneumatic tyres for £15.4s.6d. The image below shows it fitted with a useful screen for sifting soil made by Barrowscreen. Sold by Woodmans of Pinner the Barrowscreen cost 34s 11d and could fit any barrow. Wheelbarrow by Army & Navy Stores 1960. Fitted with a soil sifting Barrowscreen. Finally, two smaller items which could have graced a 60’s shed was a flame gun on wheels called the Sheen-X. and also garden sprinklers from the American Everain range, both items illustrated below. The Sheen-X had a tank that could hold one gallon of paraffin and could destroy surface and deep rooted weeds with ease. Price was £12.17s. The Everain sprinklers were both adjustable, the larger one could cover up to 2400 square feet, the smaller one a 50 foot diameter. Prices were £6.7s.6d and £3.12s respectively. Sheen-X paraffin powered flame gun.